The Wicked Witch (Item No. 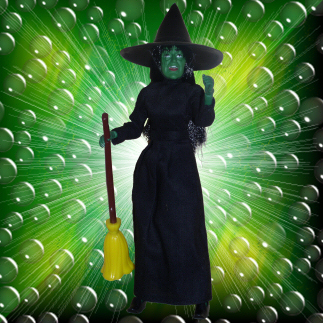 51500/6): The sixth in the line of Mego Wizard of Oz figures, this item recreates the character of the Wicked Witch of the West (Margaret Hamilton) from the film. 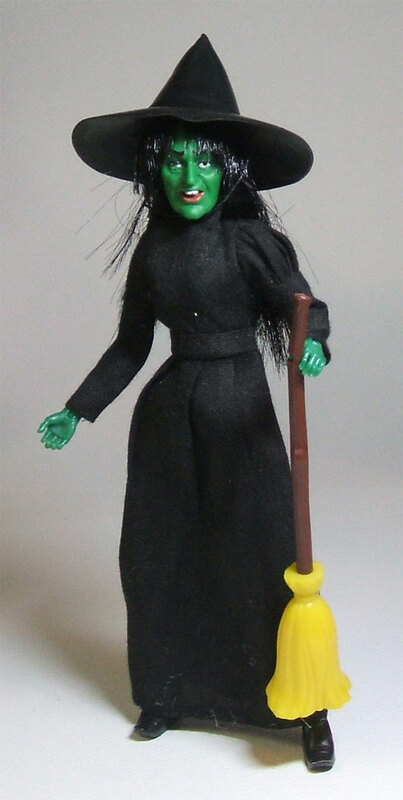 The Wicked Witch comes on a standard female Mego body (jointed knees and elbows) cast in green with “ape hands.” Her outfit is comprised of a plain black dress, a pair of black shoes and a pointed witch’s hat cast in black rubber. Her only accessory is her faithful broom, which is made up of two pieces, the handle (brown) and the head (yellow). 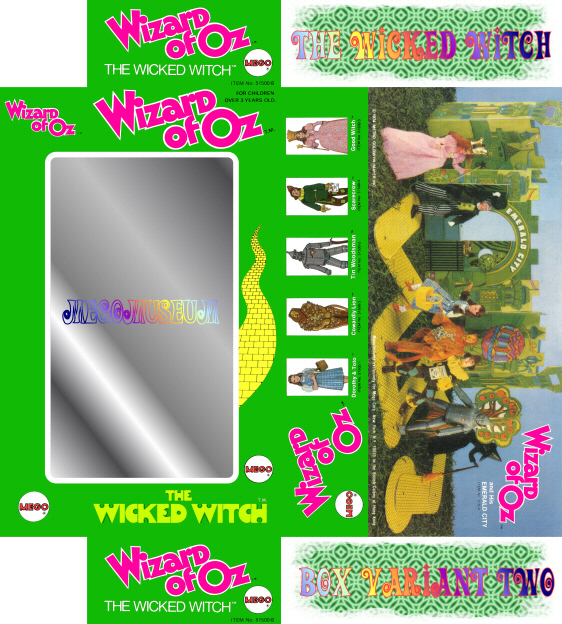 Package Variants: Like all of the other first series figures (except the Wizard), the Wicked Witch is available in both the “plain green” and “yellow brick road” boxes. She was also available in a plastic header-carded baggie for clearance purposes (a rare end-run variant), as well as being included in the ultra-rare Emerald City Gift Set (along with the other six figures from series one). She was also included with the Sears Catalog-exclusive Witch’s Castle Playset. 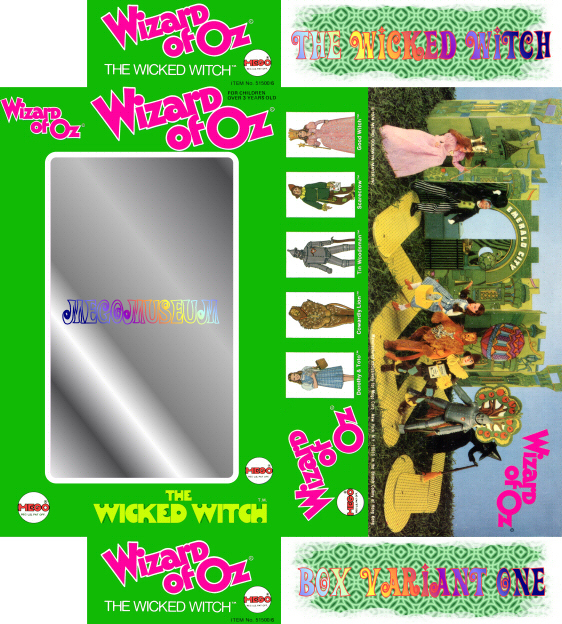 Figure Variants: The Wicked Witch is the only first series Oz figure with no known variations. Reduce, Reuse, Recycle: The Wicked Witch’s body is, from the neck down, the same as Zira’s body from the Planet of the Apes line, only cast in green plastic instead of flesh (even down to the furry “ape hands,” which probably pass for wrinkles in this instance). 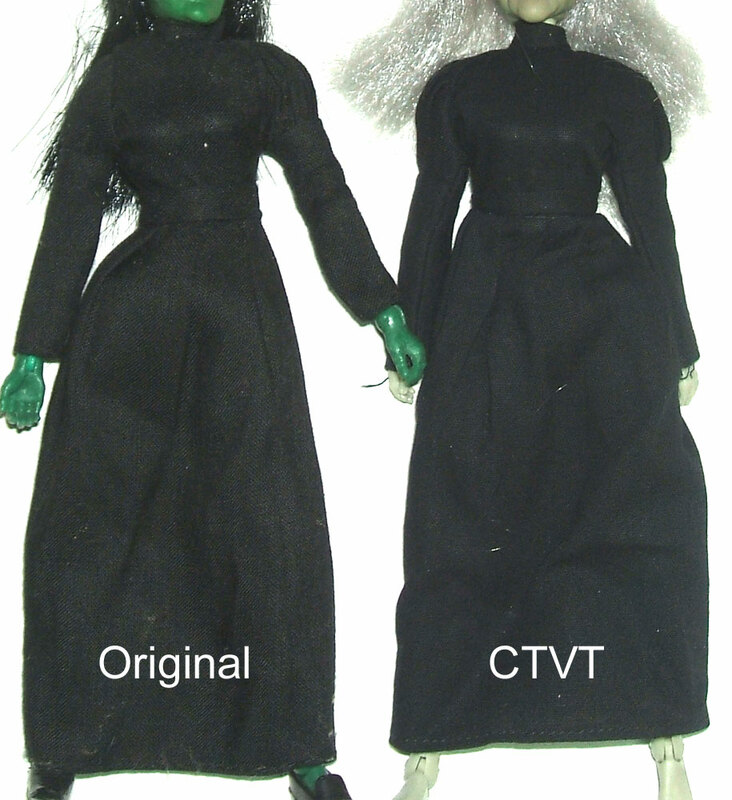 Also, the Wicked Witch’s black shoes are identical to the ones available on the female characters of the “Waltons” line of Mego figures. Caution Collectors: The elastic band on the Wicked Witch’s hat can become easily stretched out, so be careful not to strain it unduly. Also, take care not to lose the Wicked Witch’s shoes when handling a loose specimen; the footwear fits very loosely, and falls off the feet at the slightest pull of gravity. Did You Know? 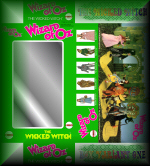 : The Wicked Witch is arguably the hardest first-series Oz figure to find loose, complete and mint. It’s not expensive, by any means, but it’s probably the only first-series figure you won’t be able to get on the cheap. 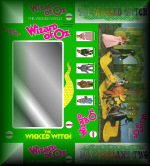 Click on the icons above to view detailed scans of the Wicked Witch’s Box Variants and Box Insert! 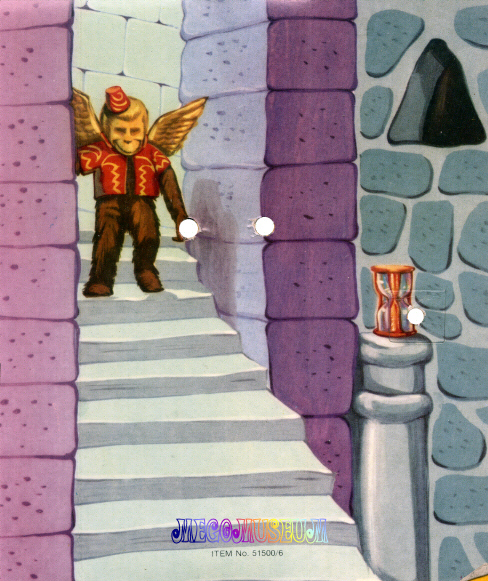 a “yellow brick road” box (right). The Wicked Witch wears a black dress that has been factory reproduced by Classic TV Toys. The reproduction is very close in make to the original. The original is a slightly more textured and very slightly thinner material. The waistband on the orignial is wider than the repro and the reproduction sleeves are a little wider. The Wicked Witch wears a black shoe with a toe that points up. This shoe can also be found on the Walton Women. This shoe has been factory reproduced by Classic TV Toys. The reproduction is a little wider at the foot opening, a touch more narrow at the toe, and has a lot of flashing evident. 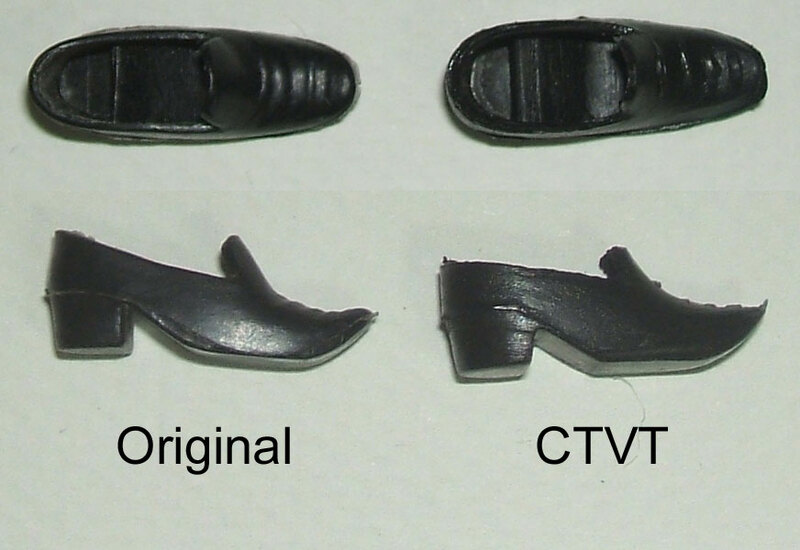 The CTVT shoe is unmarked. The Wicked Witch hat has been reproducted by CTVT. The reproduction is a little shorter, but is very close in material. The headband on the original is thinner, and the string used to hold the hat on is black on the original and white on the reproduction. The repro is marked CTV under the brim. 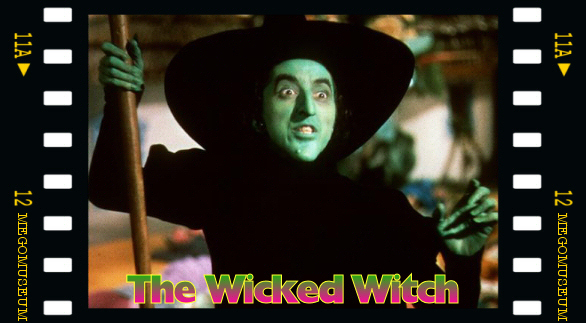 The Wicked Witch broom is unique to the character and technically has not been reproduced. However, CTVT made a similar broom for their Mad Monsters Witch. Similar because it’s a broom, otherwise it’s quite different and easy to spot.